Red clay brick is ubiquitous in the Midwest. It can sometimes seem to cover every urban building in sight. Sturdy, cheap and readily available, it is not what one expects to drink a cup of coffee from. George Barreca goes for that old Surrealist trick when he marries these two seemingly unrelated elements together in his endless series of mugs. (For the Surrealists, it was an umbrella and a sewing machine. The collision is meant to produce marvels.) 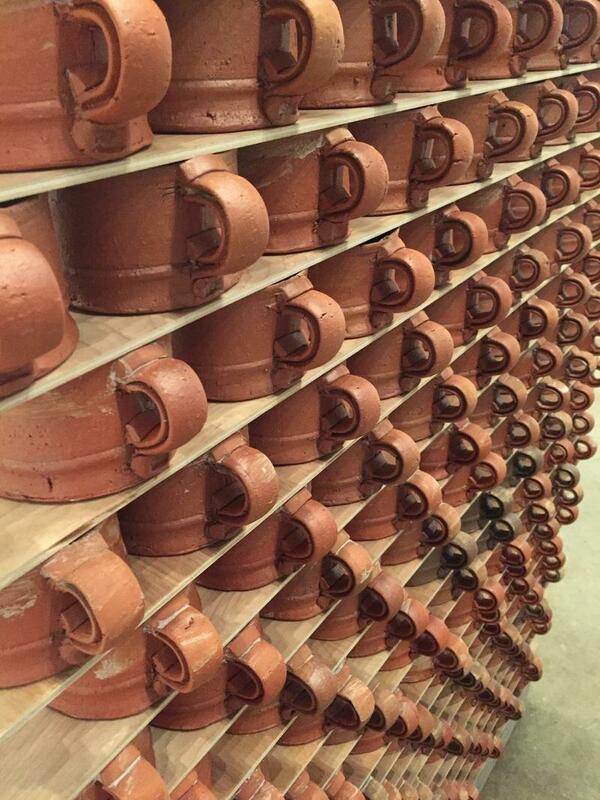 “Build” involves Barreca hand-making 200 mugs at a time out of extruded slabs of clay, glazing them with a clear liner, and installing them in an everyday location for the taking. Next up is a local coffee house, where patrons will be invited to choose a mug and bring it home for free. The act is generous and hopes to inspire. But Barreca’s mugs are plain and hefty, bereft of decoration or preciousness, and despite being individually made, not especially unique. That, in the end, may be the greatest gift of all: opening people up to the idea that art can be found in the quotidian, and not just in the elite products of the museum.